Dashboard cameras that continuously record video in a seamless loop are useful gadgets that car owners should consider for their vehicles. A simple dash cam will not cost much and after the simple installation, you can obtain a reliable record of your road trips, including useful videos of unusual events and road mishaps. Budget-friendly models provide good resolution and unlimited recording in a microSD or TF card, with the new video being overwritten in the oldest footage when the storage media is full. Most important, the dash cam is easy to use when plugged into the car charger because the video recording functionality starts when you drive the car and stops when you turn off the ignition The Lecmall 2.5-inch LCD 270° Whirl Dashboard Camcorder is an affordably-priced dash cam video recorder with audio recording functionality. The 120-degree wide angle camera provides a wide view of the road, which you can easily monitor from the 2.7-inch TFT LCD screen. Nighttime recording is made possible by 6 IR LEDs that provide illumination. The camera is equipped with a mode key that allows you to shift from video recording to taking snapshots and recording audio. The Lecmall 2.5-inch LCD 270° Whirl Dashboard Camcorder is designed for obtaining a reliable video recording of your road trips through loop video recording. It plugs easily into the cigarette lighter socket and functions while the car engine is running. Thus, you can set the mode to video recording and, at the end of the day, play back the recorded video when you want to review some details of the trip, such as altercations with other drivers and road accidents. 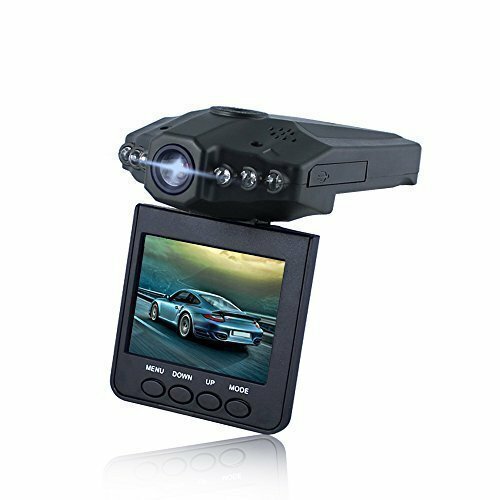 If you are looking for an affordable yet reliable dash cam for recording videos of your road trips, you can compare the Lecmall 2.5-inch LCD 270° Whirl Dashboard Camcorder with the Pangukin E93 Car DVR Dash Cam Driving Recorder and the Sharker Car DVR with 2.7-inch TFT LCD and 120-Degree Wide Angle View, which are similarly-designed to record video in a continuous loop while the camera is plugged into the car charger. If you are looking for an easy-to-install dashboard camera that you can rely on to provide wide angle views of the road that you can monitor while driving and recorded videos for playback, then the Lecmall 2.5-inch LCD 270° Whirl Dashboard Camcorder is the best option. It can be easily mounted on the windshield through a suction cup through which the system is fixed through a screw threaded on top of the camera. You can position it for easy viewing of the screen that flips from the bottom, or leave it unattended while continuously recording. In case of unusual events or road accidents, the mode key allows you to shift from video recording to taking snapshots or audio recording. The Pangukin E93 Car DVR Dash Cam Driving Recorder captures videos in full HD 1080P from a 170-degree wide angle lens. The camera features improved night vision through its six glass lenses and a built-in G-Sensor for reliability in recording even when the car passes through rough terrain, swerves or brakes suddenly or become involved in a collision. Recorded footage can be played back on the LCD screen or played on a computer or TV. The Sharker Car DVR with 2.7-inch TFT LCD and 120-Degree Wide Angle View is an affordably-priced dash cam that performs well in recording HD quality videos of your road trips. Support for night vision and motion detection and its anti-shake feature ensure that you get good video recordings at all times, even on bad roads and rough terrain. The car DVR starts recording when you drive your car, and will continuously record until you park and turn off the car ignition. The best option to take when you are looking for a reliable, affordably-priced car DVR is the Lecmall 2.5-inch LCD 270° Whirl Dashboard Camcorder. Though not HD quality, the camera will produce clear video footagesand snapshots at different perspectives from your car through the 270°-whirl feature. The next best option is the Pangukin E93 Car DVR Dash Cam Driving Recorder with its reliable G-Sensor and improved night vision. With its anti-shake feature, the Sharker Car DVR with 2.7-inch TFT LCD and 120-Degree Wide Angle View is best for drivers who regularly pass through rough roads and terrains.